Silverstone was listed in the Domesday Book of 1086. For hundreds of years villagers made their precarious living as foresters in the local Whittlewood forests. An airfield was built on flat land to the South of the village during World War Two, and went on to become a racing circuit in 1948. It has been the permanent home of the British Grand Prix since 1987 (having previously alternated with Aintree then Brands Hatch), and after contract renewal in 2009 it should continue to stage this prestigious event until at least 2026. 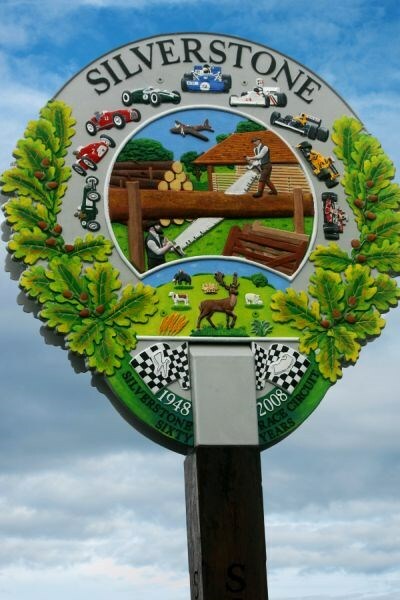 The sign was commissioned in 2008, and unveiled by Sir Jackie Stewart OBE, former president of the British Racing Drivers Club and three times World Champion. Also present was Sir Frank Williams, whose F1 team has a magnificent record in Grand Prix history. The sign commemorates 60 years of Silverstone Circuit and the importance of the motor racing industry to the village and local community. 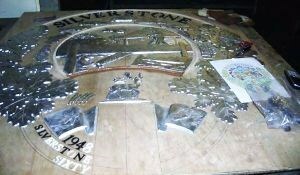 The design depicts images of racing cars from the past six decades as well as incorporating references to the timber industry which until recently was the main industry in the village, and a Wellington bomber to recognise Silverstone's war time role as an RAF base. The sign itself was forged locally in Duncote.